← #JailhouseArtDemo Pottery Throwing Video! Everything will be new again. Photo: New water bottle design. I need/want a ceramic water bottle, so it gave birth to inspiration. I will definitely be keeping one of these for myself. I am using my new “watercolor” technique on most of my work lately, and I have finally started illustrating local orchids. 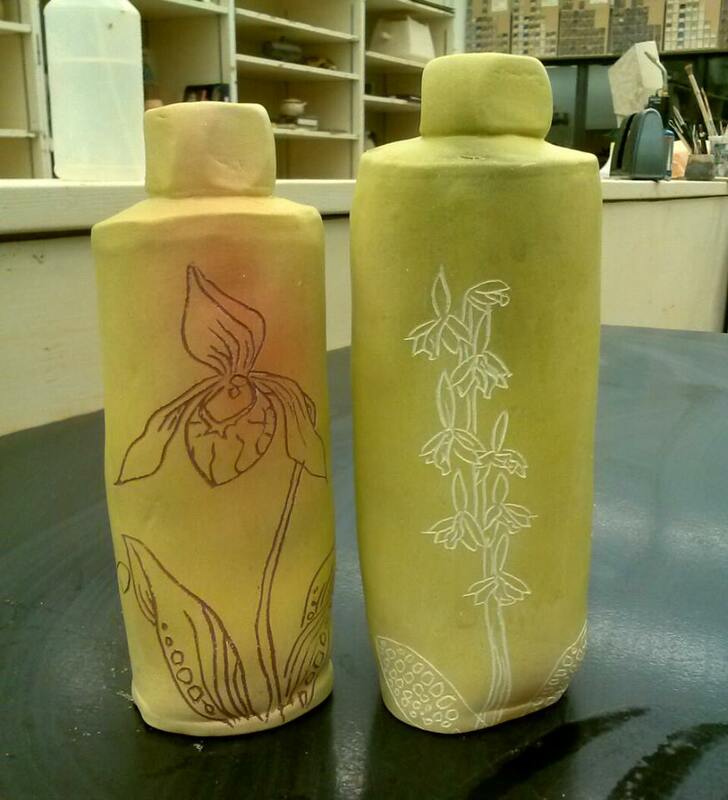 The water bottle on the right depicts a coral root orchid… local to the intermountain western North America area, but I gave it rattlesnake plantain orchid leaves just for fun. Today is a writing day. I woke up and felt like I should write, but instead I got ready for the day and rushed to the studio. It was a great day: I put in 8 studio hours and took a break to spend time with my mom. She bought me sushi and lychee fruit– it’s in season! Finally. I got a lot done in the studio and feel a good sense of accomplishment for the day. The time is edging ever nearer to the time when I pack up my car and drive across the country to my next adventure. I am so excited for my new job and new surroundings. I can’t wait to meet a whole circle of new people and have so much studio time to be able to develop my newest ideas. At the same time, I can’t help but feel a little sad to be leaving the place where I spent the last 5 years of my life, and the great studio at USU where I have been spoiled. I have had experience making work in another studio and trying to make it work when I didn’t have a studio at all, but I know I will miss all of the materials and technology at my fingertips. I didn’t ask if the studio in Massachusetts has a salt or soda kiln because I haven’t been using them here lately, but I’m probably gonna be in shock when I get there. My new work doesn’t require much in the way of specialty kilns… just cone 10. But I like having the option of being able to test things in different kilns if I want. On the up side, I will be a “top dog” in my new environment– there are no grad students and I get to be in charge of the work study kids. It will be strange at first but I think the confidence boost will be good in prep for grad school. It will also be lonely. The town is full of older people and younger kids who probably live on campus or out of town to go to school, and I will be older than all of them. In a way, it might feel like Australia a bit at first– everything will be foreign, the weather will be nice, the air will be humid, and I won’t know anybody. This time around, I will have my car and fuel stations will say “gas” “per gallon” instead of “petrol” “per litre”. Hopefully I won’t be as discombobulated as I was when I set foot in Brisbane last June. This entry was posted in Art, Ceramics, Daydreaming, Deep Thought, Design, Drawing, Nature, Painting, Science, Uncategorized and tagged ceramic art, corallorhiza maculata, kira call, new job, rattlesnake plantain, slipper orchid, travel. Bookmark the permalink.